Here’s the quilt that I made from the Tall Geese blocks that I won in the May 2013, Block Lotto. Even though the sun wasn’t out when I took this picture, I love how the colors show up with our 6″ of snow on the ground in Ohio. I quilted it with a Baptist Fan pattern. This quilt measures 54″ x 64″. You can see close-up pictures of the quilting and the back on my blog at http://www.new2quilting.blogspot.com/ Thanks to everyone that participates in the Block Lotto. It’s so much fun! You are so welcome. 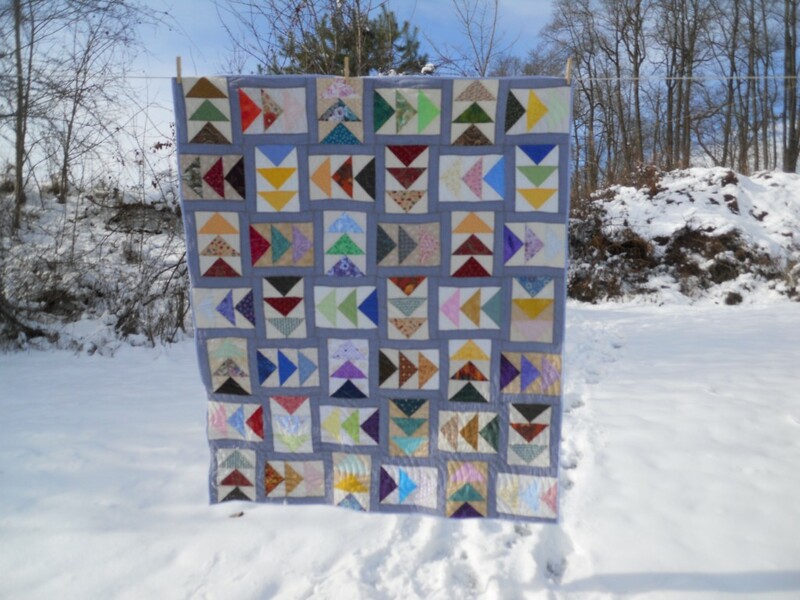 Your quilt is a great example of how what you add to the lotto blocks really sets the tone for the quilt. The blue strips tone it down and make it masculine (and I love the shirting on the back, too). Great work! You’ve made quick work of putting it all together. It looks great. I love this lay out. Makes me want to get mine out and make one like it!